I'm still fairly new to the pickle world. For the past 18 years or so I have had a strong distaste for pickles but I recently rediscovered my love for dill pickles! I made a few changes to the original recipe. It called for kirby cucumbers. I just used two random cucumbers from my in-laws' garden. I have no idea what they were. Also, I forgot to stir them at all and they did fine. 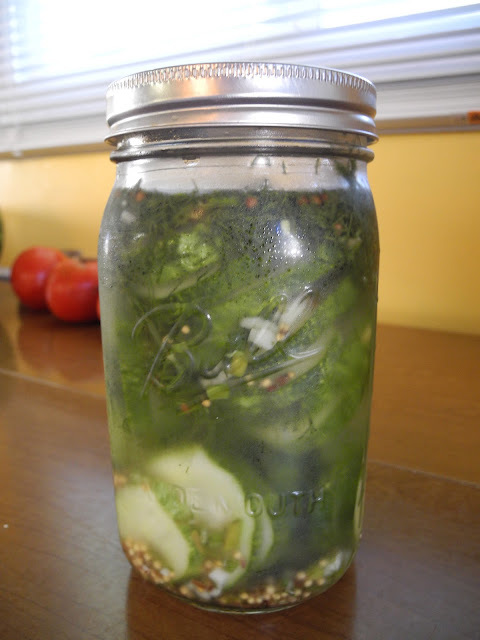 All in all, a super easy recipe that makes fantastic sour pickles! Put the first seven ingredients in a glass bowl and stir until dissolved. Cool to room temperature. Slice cucumbers, chop dill and garlic, and place in a large bowl. Pour brine over top and mix well. Cover and refrigerate overnight/twelvish hours. In the morning, put in mason jars. Store up to two weeks (if they last that long!). Yield: 1 1/2 to 2 quarts.